An extraordinary shift has occurred in the music business, and it holds an important lesson for us. Over the last decade, sales of recorded music have steadily declined. This includes all types of music in all formats—CDs, digital downloads, and so on. 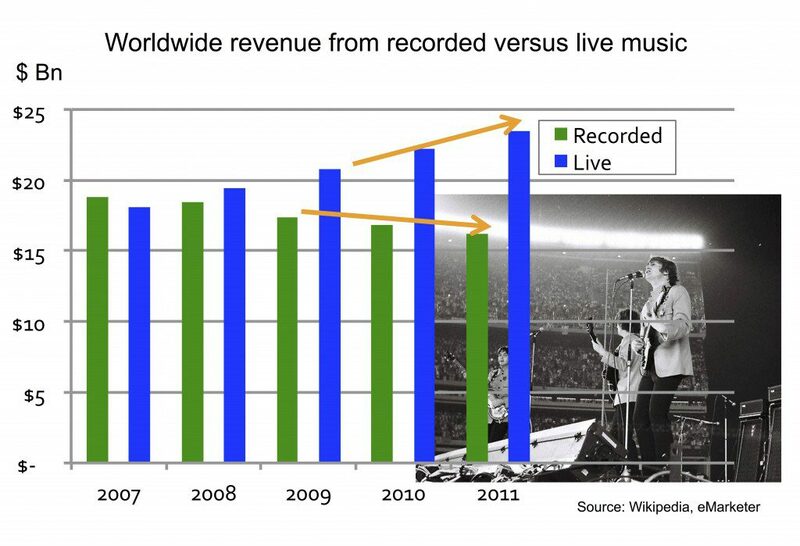 At the same time, concert ticket revenue for live pop concerts has steadily risen. These trends are displayed below, in the graph. Buying a digital recording of some old Rolling Stones songs you’ve already heard is one thing; going to see the Stones live is quite another. Their live performance is worth a lot to a fan. What’s going on? And why is this relevant to us? There are many reasons for the decline in recorded music sales, not least the fact that there is now vastly more competition for our ears and eyes—think satellite radio, Internet radio, video games, you name it. What this trend underscores is the fact that a good live performance can create a lifetime memory. It hits your emotions, your senses, and your analytical brain all at once. It’s the difference between reading that boring history textbook in college and going to hear your brilliant history professor give a charged-up, energetic talk about the battle of Gettysburg. Clients–like all of us–value an engaging, live performance. But increasingly, they do not assign a high value to written reports, analyses, memos, and yes, even physical products themselves. A case-in-point of the latter is IBM. It used to get most of its revenue from hardware. Then, from software. And now, much of their income comes from the intangible services, such as consulting, that surround and enable the hardware and software—in a sense, the “live performance” element of their service mix. To put it bluntly, you may think there’s huge value in that report you turn in to the client with all of sorts of great information and analyses. But what is really valuable to your client is your live performance. It’s having a conversation with your client about your analysis and your conclusions. It’s helping them to reframe the problem and consider their options. It’s raising the potential risks and helping them evaluate those risks in light of their organization’s specific strengths and weaknesses. It’s a conversation that helps your client make the right decision or use your solutions more effectively. Here’s an example of the ultimate live performance, chronicled in a recent New York Times article “Goldman, Citi, UBS…and a Guy in an Office.” Paul J. Taubman, a former Morgan Stanley banker, basically set up shop as an independent M&A advisor, and in 2013 he was credited with $175 billion in deals—putting him at number 11 on the league tables, surrounded by major investment banks on either side. Incredible, really. This is an extreme example, but it illustrates the power of the live performance. Taubman was not spending a lot of his time writing PowerPoint slides and doing spreadsheets for Verizon and the other clients he advised. No, he was out in front of his clients, on his feet, helping them navigate the intricacies of major deals. Information and data, alone, are mostly commodities. Brokerage reports analyzing the stock market, for example, used to be only available to a firm’s best clients. Now, virtually anyone can download them from the Internet. Products are commodities. Even a breakthrough product like the iPhone is supported and enhanced by best-in-class telephone customer service as well as Genius Bars in hundreds of Apple stores all around the world, where you can get a personal consultation for free. The value of what you do lies in the application of your products and services to the client’s business problems and opportunities. The live performance ensures that happens. A conversation is a dynamic, fluid event that can quickly adapt to a client’s real problem or most pressing issues. A written document is utterly static and cannot adapt itself on the fly. It’s hard to make a written report or memo “stand out” and wow the client. But a great live performance can do exactly that. First, reallocate time from report writing and formatting, internal meetings, etc. and hold more live meetings with prospects and clients. Instead of working on those PowerPoint slides till midnight—have dinner with your client to discuss your ideas and suggestions for improving their business. Second, rehearse your live performances. If you play tennis or golf seriously, how many times do you practice your serve or putt in order to perfect them? How about your client conversations and sales pitches? Clients tell me that many professionals who present to them are woefully underprepared for their live performances. They ask poor questions or none at all, and lack coordination with the others on their team. Third, make sure you’re in sync with your colleagues. When the Beatles appeared on the Ed Sullivan Show in February 1964, they were relaxed, musically tight, and noticeably having a great time. But what most people don’t realize is how much face time they had invested in together, leading up to what was their effective debut on the world stage—for example, 293 shows at the Cavern Club in Liverpool, and thousands of hours on stage together in Hamburg, Germany and throughout England in small town halls and clubs. Fourth, create more informal client interactions over coffee, lunch, dinner, and so on. Meet with your client in-between major events or project milestones, just to share what you’re seeing in the marketplace and to ask them thoughtful questions about their evolving priorities. Remember, the live performance doesn’t have to be a big sound-and-light show at Madison Square Garden. It can be an intimate conversation over a cup of coffee or a glass of wine. And fifth, be willing to travel to see the your clients to have more live performances, and double-up when you do travel. Going to Chicago for the day? Try and connect with another prospect or client for a quick visit before you leave. Doing your email for two hours in the morning doesn’t add a lot of perceived value to clients. Nor does editing and re-editing that report until you think it’s perfect. In my experience, no report or memo survives contact with the client—you need the live performance to really engage with your client and process your insights for them in a way that is practical and leads to real change. Are you getting enough live performances in front of your prospects and clients? Remember, if you want milk, you have to get out of your house, trudge through the snow, and go out to the barn. Are you willing to put your boots on?